Senator Bill Monning (author of resolution), CWD! 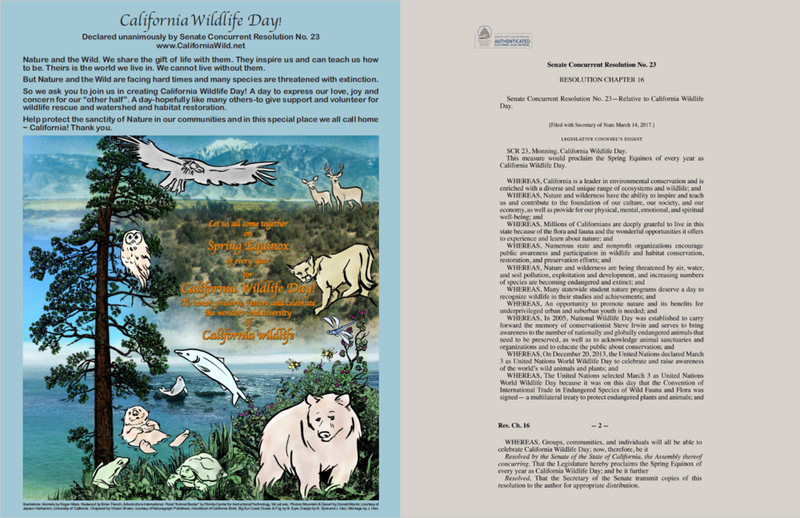 creator Beverly Eyre, and Lorin Letendre of CRWC celebrating the resolution that made California Wildlife Day! possible. California is a leader in environmental policy and conservation. Our state is filled with diverse and unique ecosystems, which is why California Wildlife Day! was formally established through legislation sponsored by Senator Bill Monning and passed in the California Senate in March 2017. A copy of the concurrent resolution is attached. Nature and wilderness are a source of inspiration, education, and physical, emotional, and spiritual well-being. Many state and non-profit organizations work to promote environmental awareness and stewardship and will collaborate to provide opportunities for education and service for California Wildlife Day. California Wildlife Day will be celebrated annually on the Spring Equinox; for 2019 that will be March 20th. This California Wildlife Day! site does not accept donations.